Last weekend we took the high speed train to meet a friend of mine, who was in Budapest for a Conference. It was Jon's first time on the high speed train, and it was a 3 hour trip one way. We saw some of the beautiful countryside of Austria and Jon studied a bit for his impending A1 German test, while I read for work. We arrived at lunch time, in a station that from the inside, looked everything like you would imagine a train station behind the Iron Curtain. However, once you ventured outside and looked back at the station from the city, it was quite grand looking. We met my friend on the street as we walked toward the Danube, and we used the TripAdvisor CityGuide app on my iPhone to find a nearby lunch spot. The first place we went wash a Jewish Hungarian restaurant, which was so popular, we would have needed reservations to eat lunch there on a Saturday. 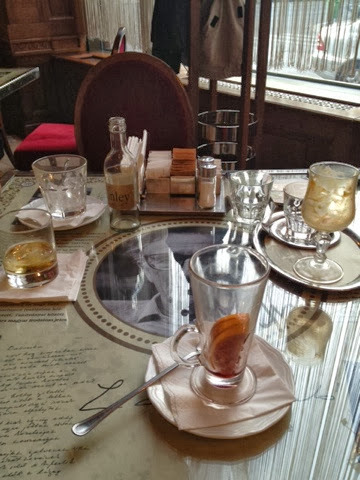 Our second spot, though, proved to be a cute, cozy bar/cafe which was quiet and served good food. The buys ordered beers and I had an Aperol spritzer. Jon ordered a delicious Thai chicken soup, and I had Hungarian cheese spread with local olive bread and veggies. Our friend ordered duck risotto, and we discussed our next move. Contrary to my own custom, I recommended a city tour, and the boys agreed that in our limited time window, it seemed like the best plan. We walked down to the New York Mansion, now an extravagant 5 star hotel, and bought our tickets for 5000 forints a piece (about 15 euro). The pick up was just outside, and an open air double decker showed up straightaway. We filed into the back seats on the top of the tour bus, and shortly were rumbling toward the city center. Classical music played while driving, until the narration interrupted intermittently. We heard about the history of Hungary, as well as each landmark we past. 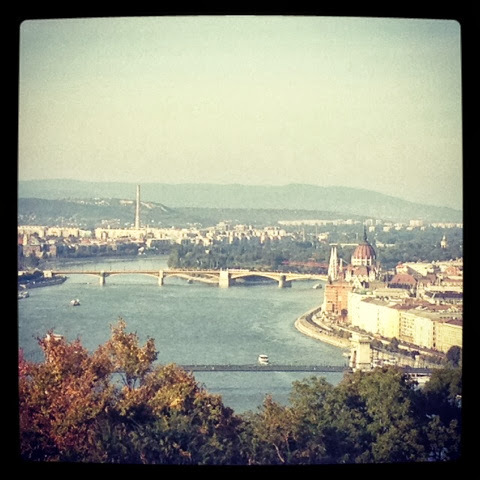 We took in the Chain Bridge, Budapest Castle, Fisherman's Bastion, the Sinagogue, Heroes' Square, and Citadella. Many of the buildings looked a lot like the buildings in Vienna, but sadly several of them displayed chipped plaster, and soiled marble. We decided Vienna might be just a little spoiled, in so far as their capability to keep so much of their history and traditions and so many of their buildings so pristine. On Budapest's behalf, though, we learned from our bus narrative that as much as 80% of the city was destroyed by bombing in WWII. To see so many buildings majoritively restored was impressive, and took some of the melancholy out of the disrepair. It was a chilly day to tour on the open bus, so when it dropped us off again we headed inside The New York Cafe, also known as the most beautiful cafe in the world. Just to warm up, we ordered a round of drinks before once again heading our separate ways. I had, of course, mulled red wine, and Jon ordered Jameson and Ginger on the rocks. Adam got some fruffy white chocolate liquor coffee, and we all took pictures inside, in true tourist fashion. But nothing could diminish the grandeur of the Sinagogue and the Parliament, draped dramatically along the east side of the glittering Danube, or the stalwart Chain Bridge, having survived war as well as Communism. 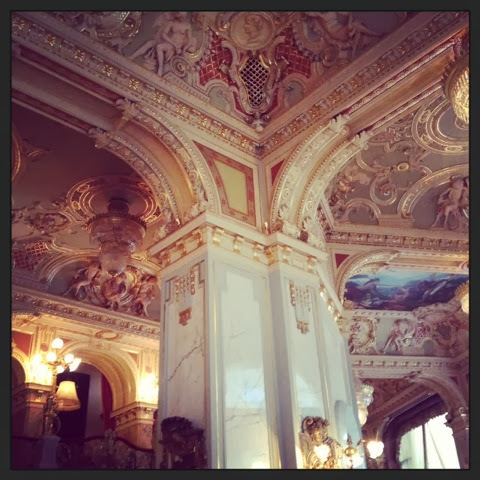 A day or two in Budapest is well worth the comfortable train ride, and we hope to make the trip again sometime.